The Blae & Black is a drab looking wet fly but has earned it's place as one of the old greats as it has never lost what it takes to kill trout. This a very ancient pattern whose origins are lost in the mists of Fly Fishing folk lore and time. The Blae & Black is an old wet, early season, pattern that is a popular top dropper when fishing a team of three. loch style. Tail (optional) : Pheasant tippet or blood red feather. Body : Black seal fur, water-rat or mole. Wing : Grey duck, medium starling or hen blackbird. Head : Whip finish, trim and clear varnish. The Blae and black tied on larger hooks is used for Salmon and Sea trout with equal success. 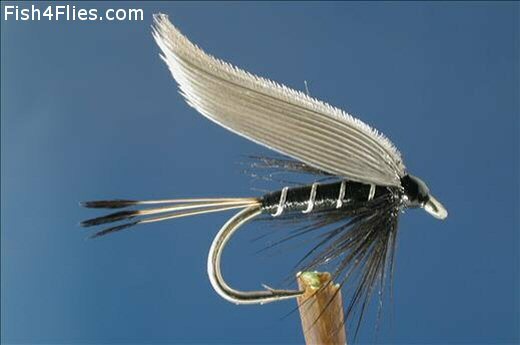 Currently there are no comments about the Blae & Black fly pattern from other fly fishermen yet.